· አባ ጳውሎስ በሌላቸው ሃይማኖትና ምግባረ ጽድቅ ሕገ ቤተ ክርስቲያኑን በማሻሻል የፓትርያሪክነት ዐምባገነንነታቸውን ለማጠናከር እንደሚሹ በጉልሕ ያሳያል፡፡ ለዚህም ርእሰ አንቀጹ ‹‹በ1991 ዓ.ም ተሻሻለ ተብሎ የወጣው ሕገ ቤተ ክርስቲያን . . .አልፎ ተርፎ የቤተ ክርስቲኒቱን ርእስ የብፁዕ ወቅዱስ ፓትርያሪኩን መብት የሚጋፋ ነው፤›› የሚለውን መጥቀስ ይቻላል፡፡ ኧረ እንዲያው ለመኾኑ አባ ጳውሎስ ራሳቸውን በአምሳለ ንጉሥ እስኪመለከቱ ድረስ የቤተ ክርስቲያኒቱን ሀብት እንዳሻቸው እያባከኑ ባሉበት ኹኔታ የትኛው መብታቸው ነው የተገፋው? ወይስ በጣዖትነት መመለክ አማራቸው? menafeqanena paster paulos ezihe ga bibeqachewe melekame yemeselegnale!!!! Egziabher amlak yekir yebelen. yehe hulu fetena bebetekrestiyan lay yemetaw begna hatiyat mekniyat new. ahun ye Dengil maryam lij like kahnat Eyesus Kirstos yekir yebka yebelen. lebetekrestiyan ena lelijochwa selamin yestelin. Dejeselamoch Egziabher yestilin yabertalin. አሁን ጉባኤው መንፈሳዊ የሲኖዶስ ጉባኤ ቀርቶ እኛ አባት ያሉት የመንደር ስብሰባስ መች ሆነ?? አለም አቀፋዊት የሆነችን ተቋም የሚመራ ጉባኤ ያውም እግዚአብሄርን አጋዥ ያደረገ ጉባኤ እንዴት በጎረምሳና በባልቴት አጀንዳ ስራ ይፍታ!!! ምን ይደረግ!!! እኛም ያለቦታችንና የእነርሱ ድፍረት እኛንም ደፋር አድርጎን ሲኖዶስን መካሪ አደረገን! ወይ የተገላቢጦሽ ዘመን!!! ያን ለቅዱስ ሲኖዶስ ያለኝን ፍርሃትና ግምት አሳጥተሁ ይህን ያስጻፍኩኝ አባ ጳውሎስ ሆይ እባክዎት መንበሩን አስረክበሁ እኛም የምናከብረው እርሱም የሚያከብረን አባትና ቅዱስ ጉባኤ እንዲኖረን ይተባባሩን !!! Dejeselam, thank you for your devotion in following and reporting the current issues occurring in our church. It is just today the Ethiopian Christians to put the dictator and protestant Ato Paulos and his followers in jail for the frequent crimes made on Kidist Tewahido. All Sunday school attendants and MK must take the responsibility to organize the march against the criminals. The march must be conducted on Monday morning. Please, pass all such messages to all. Dejeselamoch lemitaderigut Yebetekiristiyan Wuleta Egziabher amlak wagachihun yikifelachihu. 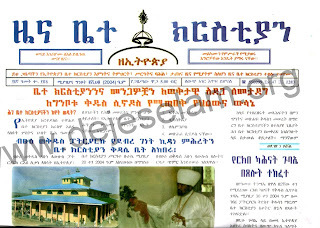 እግዚአብሔር ይስጥልኝ ደጀሰላማዊያን ከቀደም አስተያየቴና ጽኑ እምነቴ ጋር ባልተየ የመልካም አቋም ማሳሳቢያ በማስቀመጣችሁ ምስጋናየ የበዛ ነዉ፡፡ በተረፈ የደጀሰላም ታዳሚዎች የምናነበዉ ለወሬ ሳይሆን ወደ ተግባራዊ ሥራ እንድንሸጋገር ነዉ፡፡ ከወዲሁ ለቅዱስ አባቶቻችን አጋርነታችንን ልንገልጽ ያስፈልጋል፡፡ ከማንኛዉም የዉንብድና ጥቃት ለመከላከል እራሳችንን ብንቃት ማዘጋጀት ይኖርብናል፡፡ መረጃዎችን ለምእመናን የማድረስ ተግባር በፍጥነት መከናወን አለበት፡፡ በቤተክርስቲያንና በህዝብ ላይ ያለዉ ንቀት ለአንዴና ለመጨረሻ ሊቆም ይገባዋል፡፡ ጎራዉ ለይቶአል ጠላታችንንና ወዳጃችንን ለይተናል ከዚህ በኋላ የምንጠብቀዉ ነገር የለም በቃ በቃ በቃ!!! እግዚአብሔር አምላክ ለቤተክርስቲያን ለመቆም ጽናቱን ይስጠን፡፡ እግዚአብሔር ኢትዮጵያንና ህዝቧን ከመጣባት መከራ ይታደጋት አሜን! 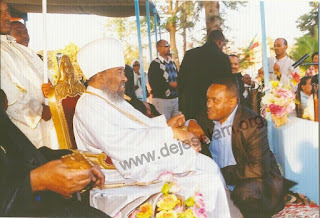 Bemejemeria ledejeselamoch masasebia, Endene kezare jemiro patriarch tebiyewun ena ye Americawun wenbede "Abune " "Kidusnetachew" " Btsuentachewe" eyalachihu metirat aqumu. Hizbu Benezih sewoch lay endaynesana ewunetegna abatochun endayikelakel gira yemitagabut enante nachihu Bemayigebachewe maereg eyeterachihu. Enkwan yihe maereg yeminkusna simim ayigebachewum. Silehonem menafiqinetachwunan wunbdinachewun yemiyasay sim wotolachw hulum blogoch bezih enditeruachewu madreg yasfeligal. Lemisal "Ye elzabel paulos" ena "Jobirawe melaku". Egna ye adis abeba wetatoch leqidus sinodosu yalenin tazajinet hawultun bmeneqaqel engeltsalen. Yih yebete kirstiyan guday new mengistin ayagebawum. Miknyatum yebetekiristiyanua yebelay akal qidus sinodosu wusane silesete. Ewunetegna Abatochachin lay enkwan dibdeba qerto yemayigeba qal yetenagere yejun wediyawu yagegnatal. Egziabhere betun kewenbedewoch matirat yifeligal egnam wenbedewochin lemaswetat tezegajitenal. aye gud....aye "aba" pawlos...minale keto bimot....aye amlake..
Get rid of him now!!! If we stand together he is just an old man! memar yeneberebin kabatochachin neber gin yalemetadel honena alihonem enigidih yetewahido lij kitet musilim wegenochihun temeliket yslemesiwatinet yemigegn tirif wuridet bicha newu enih sewech aligebanachewumi aliyam aligebunim megibabiyawu kuwanikuwa mebitin betigil masikeber newuna fitsum kirisitiyanawi ametsin amitsen bekachihu enibelachewu sile ewunet lebetekirisitiyan enikum !!! Ahun Gezie tesatu honalena Ebakachehu Hulachenem Tegeten Entselie Enalkese. Menem Enquan Yetensaye wokete behonem Entsome Entselie Enalkes adera kabatochachen gone enekume Alenachehu Enbelachew. Adera Yadis Ababa krstianoch Abrachehu hunu Attitegnue. Birtu Abatoch Yehe woket Yemechershaw mehone Alebet. Egna Angetachen koslo Aemeroachen teblashto Sele Ewnetegeoch Abatoch Yet Tefuben Eyalen Eylkesen new Yekeremene Ena Adera kefesame Aderuslen. Eme Amlake Woladite Amelak Atleyen Lewsanawme Abra trdane. Amen . የተዋህዶ አምላክ ልባችንን ለከበረ ሰማዕትነት አጽና ! የቅዱስ ጊዮርጊስ አምላክ ልባችንን ለንጹህ ሰማዕትነት አበርታ! የሰማዕቱ የቅዱስ መርቆሬዎስ አምላክ ልባችንን ለታላቅ ሰማዕትነት አበርታልን !ጌታችን መድኃኒታችን ኢየሱስ ክርስቶስ ሆይ አንተ በከበረ ደምህ የመሰረትካት፣ቅዱሳን ሰማዕታት በጽኑ ተጋድሎ የሞቱላት፥ ቅድስት ቤተክርስቲያን በመናፍቃን ተወራለችና፣ መቅደስህም ገንዘብን በማፍቀር በተፈለፈሉ ወንበዴዎች ተደፍሯልና፣ አቤቱ ለቅድስት ቤተክርሰቲያን የከበረ ሞት እንድንሞት አንተ አጽናን! ከፊት ምራን ከኋላም ተከተለን አሜን አሜን አሜን! Ebakewo aba pawelose hoye chegere sayefeteru beselame seletanewoten aserekebu. I am afraid that we are on a very dangerous junction now. Before everything else, what's needed now is prayer. Yemihila tselot. I have no clue how that can be achieved without the fathers issuing it, but that's what is necessary. If God is with us, he could change everyone's heart; yepatriyarikun bemamraratim hone yelelochun qoraT bemadreg. What a disgrace he is doing against the holy Church and the holy synod!, now it`s the right time to say enough is enough to the so called patriarch aba pawlos! let` stand and act right now!!!!! so help us God and Dingil Mariam!!!Amen! Ere gobez ... tewu yihnie eninesa .... abatochachin bewerobeloch ena beduryewoch tekebewu yigegnalu ena ... kereb bilen betekrstiyanin enaskebr. The time for tselot minamin is over! what the AddisAban miemen need and must do is action. For how long are we going to stand on the side while the thugs led by Aba Paulos destroys eotc as we know her? For how long are we going to be spectators when our fathers are beaten and humiliated by the thugs and cronies of Aba Paulos? When are you AddisAbans going to say enough is enough like the Gondares did against the government's plan to dismantle our sacred monastery, Waldiba? May be the Synod should convene elsewhere like Gondar or Bahirdar or Nazret or even Axum or Mekelle. The AddisAban m'emenan have so far done nothing to protect the church from the onslaught of the Aba Paulos Gange. They have even ereted a Haulit which the Synod found heretic and approved its removal. Is AddisAba a city of Muslims and Pentes only? I absolutely agree with Deje Selams call to stand behind our fathers and implement their decisions. We should start by destroying Aba Paulos's Tawult in front of our Church. No more praying, fasting, crying blah blah. We have tried that for years and nothing has happened excepting multiplying our problems. God wants us to take matters into our hands, and that is exactly what we have to do. The church is ours! She is not the property of the corrupt patriarch nor his criminal gang. My apology for talking like this. honestly, i am not a religious man, but i have so much respect and love for my church, the church of my ancestors. The church is even where i learned ha hu and my Ethiopian personality. We must fight to save her from the men who takes for a cash cow. I don't even believe Aba Paulos believe in God let alone by the power of the synod. ወንድሙን የሚያንቋሽሽ የሚሳደብ ጨለማ ውስጥ ነው የሚኖረው፡ በማለት ቅዱስ መጽሐፉ ያስተምረናል። መሪዎቻችን ከኛ ወጥተው እኛን ለማገልገል የተመረጡ እንደመሆኖቻቸው የኛኑን ማንነት ነው የሚያንጸባርቀው፡ ነገሮችን ፊት ለፊት ተጋፍጠን በራሳችን ላይ ያለውን ጉድፈት ማስወገድ ይኖርብናል። ፓትርያርኩን አንዴ ፕሮቴስታንት አንዴ ካቶሊክ ናቸው እያሉ መጥራት ዋጋ የለውም። ገበሬውም፣ ተማሪውም፣ዶክተሩም መንፈሳዊ መሪውም ሁሉ አገሩን ለቆ አሜሪካና አውሮፓ መኖር ይፈልጋል፡ ፈረንጆቹ ደግሞ በነጻ የመጣላቸውን ስጦታ በረቀቀ መልክ በደስታ በመቀብል ከ20 ወይም 30 ዓመታት በኋላ የሜመጣውን ትውልድ እንደ ፍላጎታቸው ለመግዛት ያመቻቸው ዘንድ እነዚህኑ ዶክተሮች እና የሃይማኖት መሪዎች ይጠቀሙባቸዋል። አባ ጳውሎስ ላይ የሚታየውም ይኽው ነው። በነገራችን ላይ የዶክተርነት ማዕረግ ካውሬው ምልክቶች ውስጥ አንዱን ይገልጽልናል። ጥሩውን ከመጥፎው ለመለየት እድሉ የተሰጠን ካለን ማድረግ ያለብን በሃዘን ለነዚህ ወንድሞቻችን ጸሎት ማድረስ መቻል ነው። ለመሆኑ፡ ተሃድሶ ነን ከሚሉት መካከል ወደ ተዋህዶ ተመልሰናል፡ ተሳስተን ነበር፡ አሁን ንስሃ ገብተናል ለማለት የበቁ ወገኖች አሉን? Thanks DJ for the article. 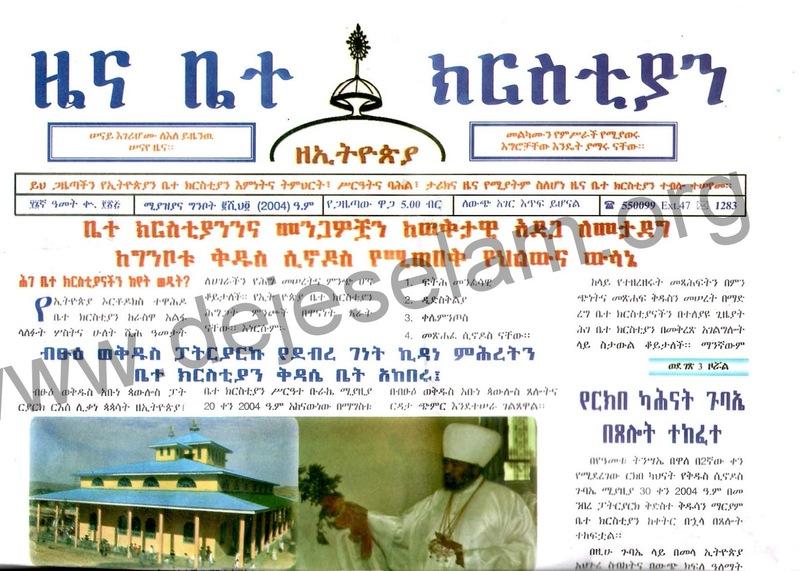 Can you please scan and upload the newspaper of "zena betekiristian" It is good we also have a good look at the material. It is also a clue or proof of what you analyse in your blog. Finally I would like to stay, we Orthodox Christian, this is the time to stay united. Let us stop supporting groups. Let us just fight for the truth, not for aba, or deacon or whoever it is. Let us fight so that everyone follows the rules of the church. Let us pray!! Our father's mothers gave our mother church as healing as it is. We this generation have responsibility to pass the church for the next generation. Please let us pray to fight the evil sprit surrounds us and trying to destroy the mother church.